(i) Azeez Yakub a.k.a Baba Muri (Principal Suspect) who is a notorious armed robber and have been arrested, charged to court and convicted to prison severally. This suspect now in Police custody has made confessional statement to the Police investigation Team, he confessed and admitted that one Abdulfatai Kadri a.k.a (Adedoyin), the vigilante commander in Adeta Zone, introduced him to the business and also supplies the human skulls and other body parts for him to sell. 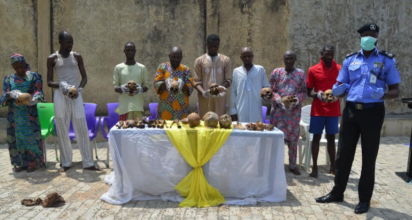 Eleven (11) Human skulls were recovered from his possession during police search on his residence. The principal suspect confessed that Abdulfatai Kadri has brought to him Twenty (20) human skulls that he exhumed from the Ilorin Community Central Burial ground situated after idl-praying ground in Ilorin, Kwara State. He further admitted that Abdulfatai Kadri a.k.a (Adedoyin) usually brings in the human heads to him in batches of Four (4), six (6), Eight (8) for safe keeping and usually collect them within a day or two, and also informed him of the personalities in Ilorin and other he usually supply the heads to. Investigation is still ongoing and efforts being intensified to arrest other suspects including prominent personalities mentioned by the suspects but who are still at large. They will all be arraigned in court on completion of investigation.